ktsue2002 wrote: So sorry to hear about Cindigirl. She will be missed. I too enjoyed some of the witty things she said to me when I first started. I too face my own battles right now. Currently, my transplanted kidney is starting to reject, and I will spending a couple of nights in the hospital to hopefully save my new kidney by getting my body to accept it once again as a part of the happy Katie body. I told my lovely living donor that her kidney must have said something mean about George Clooney, and my immune system invited her to leave by starting to eviction process. You know how sensitive us Clooney fans can be. We can talk constructively about his life and mistakes, but if a stranger comes in and does the same, we fight them off. So now the course of action is to pump my body with heavy steroids and force my immune system to OK with my new kidney saying "No, The Good German really wasn't that good and No, He didn't deserve the Oscar for Batman!" In addition, my new kidney has to learn that the ktsue body will always love George Clooney, his movies, and all that makes him the cool guy we love." Once a Peace Treaty is signed, my new kidney will be allowed to stay and my immune system will learn to love her again after several months. Really so sad to hear about Cindigirl! It is even tougher to think of when you are in the hospital facing your own battles with mortality. I know the doctors can't predict the future, but I really need to save this wonderful kidney of mine. Please, consider praying for my new kidney. I also would like to live and see all these GC movies ahead of us without being hooked to dialysis machine or you know dying. As always, I would also LOVE, like the rest of us, to get some physical contact like a call or visit from our favorite George. Hey, I am in a hospital bed, I can dream can't I? Sending my condolences to Cindi' family. 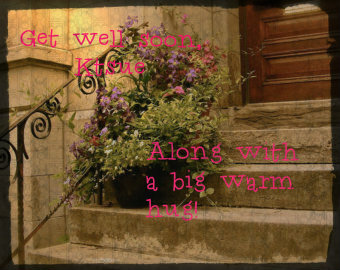 Thanks for that theminis and yes, my best wishes for a speedy recovery ktsue. You just tell your kidney that it wants to be part of a George Clooney fan and no more nonsense! ktsue It won't be long before your body and brand new liver make friends. You know sometimes it is hard to except new things. Like I said before I am sending you very strong prays for a speedy recovery. God Bless. If every you want to chat you can PM me anytime as I am sure with most on here. God Loves you and stay strong and keep a positive outlook, it makes a big difference. Hope the best for you sweet baby! Ktsue....Thinking of you....DON"T tear up your G picture....what will you do without it for the next 30 years! Your posts reveal a pleasant demeanour & a positive lady. Stay strong. Had a friend that experienced a battle with rejection and pulled thru. I keep you in my prayers and hope that your new kidney will finally find out how great it is to be a Clooney-fan. Ktsue, Will be praying for you. Stand on your faith, it will work out for you. Okay no one else can be sick for a while...I'm lighting so many candles for healing that I'm going to burn my house down! I am on my way home now. My rejection was one of the easier ones to treat. I will be on steroids for a while, but it is all in an effort to keep my immune system from attacking my new kidney. So far, so good. My function has been improving each day. Lighterside wrote: Okay no one else can be sick for a while...I'm lighting so many candles for healing that I'm going to burn my house down! ktsue2002 wrote: I am on my way home now. My rejection was one of the easier ones to treat. I will be on steroids for a while, but it is all in an effort to keep my immune system from attacking my new kidney. So far, so good. My function has been improving each day. We will be praying for you, ktsue. I hope that you will get better soon. God Bless. Now be a good girl and get well again. Best of wishes to you kitsue, hoping you will soon be well again. Fantastic news! One day at a time and then suddenly you'll look back and think..."Wow, was my transplant a year ago already?"